We are all exactly where we need to be. It came to me this morning, as I was doing yoga before dawn. As the light slowly filtered across the landscape, I noticed an odd shape outside our lounge room window. A kangaroo, with a joey in her pouch! No more than four metres from where I sat on the rug. I watched, entranced, while she nibbled the grass, and gently lumbered across our lawn. The stillness, and the presence of nature – so close! – made me very reflective. 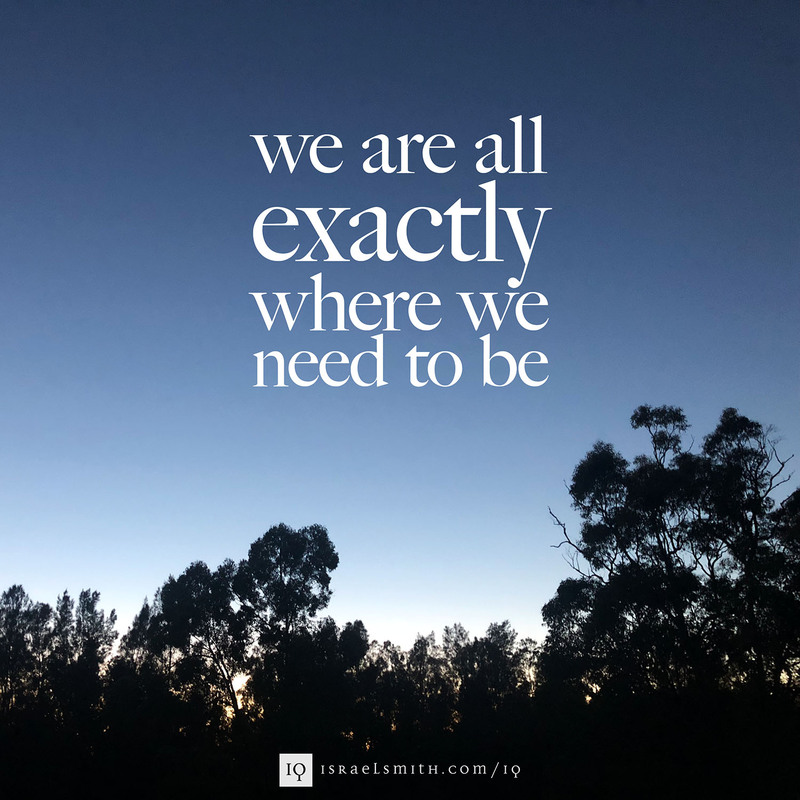 It came to me that, truly, we are all exactly where we need to be. Our lives and experiences to date have led us all to this point: every decision, every action, every conversation, have all led us to be exactly where we are today. I’m not sure what I believe about the nature or identity of God, and I don’t know whether we’re all travelling some pre-ordained path. I tend to find comfort in the belief that we are all capable of divinity, and that there is some power or force that connects everything and gives all life its spark. I don’t know how to classify or name that power – for most, I guess, it’s God. I do believe that we’re here on Earth to learn, and especially to learn to love. Love of ourselves, of our fellow human, of animal and plant life, of our family, of our work, of our mother Earth… All of these forms of love are valuable and important, and I believe the pursuit of their mastery is our real calling or purpose here. Which brings me to my quote again. We are all exactly where we need to be. We are at this point in our journey for some reason. To teach us something, to show us something, to give us a particular experience. We’re all experiencing precisely what we need to at this point in our path as humans – individually, and collectively. There’s some comfort in that thought, to me. I hope it brings you some comfort, too. Previous Post: « You are not alone.